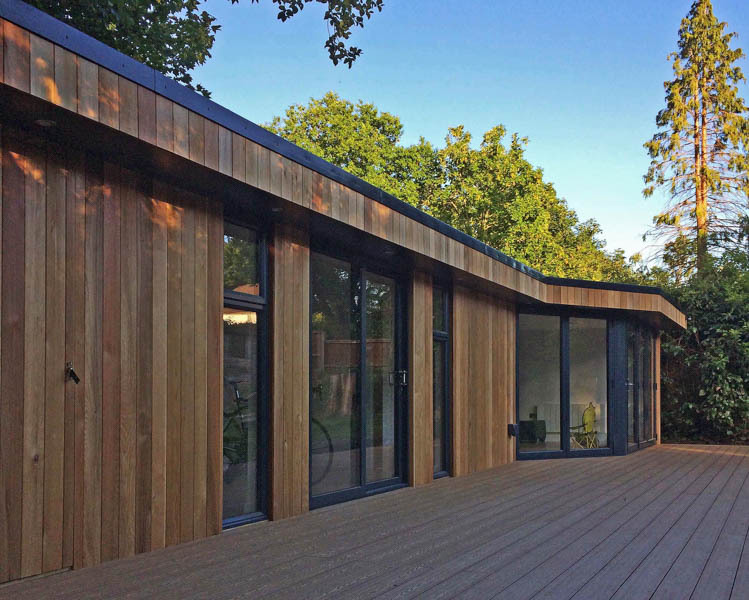 This is an interesting project by Swift Garden Rooms which proves how a garden room can morph into different uses. Swift’s customer was having extensive work done on their house and decided that the first phase was to create a garden room, that could act as a comfortable base while the work took place. They also had a vision of how the building could adapt to their families needs in the future: as a playroom, home office, guest room etc. At 14.5 meters wide this is one of the widest garden rooms we have featured. The building spanning the width of the garden. Placing a garden room across the garden like this can be a very good use of space and visually effective. It is a design trick that can be applied to gardens big or small. The space has been divided into two main living rooms with a compact shower and storage room at one end. We particularly like how the Swift team have shaped one end of the building rather than creating a standard rectangular building. This design detail gives the garden room a lot of character. A partition wall divides the two rooms. The Swift team have fitted a pocket door between the two rooms. This is a clever choice as the door will slide back into the wall making it invisible when open and freeing up space for furniture and flow of people. The Swift team organised the connections of the shower room to the mains supplies as part of their turnkey service. The groundworks to connect to the mains services included the installation of a pumping station. The storage room is accessed via a ‘secret door’ on the front elevation. The Swift team have carefully matched the cladding on the door with that on the wall to help it blend in. A large composite deck has been fitted in front of the garden room. The plan is that this will lead to a swimming pool – another future use for the building, a pool room. This project required a planning application and Building Control consent. The Swift team can handle these applications as part of the overall project, to make it a stress-free process for you. To learn more about this project, talk to the Swift team on 01625 875 588 or send them an email. Take a look at their website to explore more of their work.